These new ships wil enable the RDN to paticipate in a great number of different tasks, says the Admiral Danish Fleet, these ships will be able to endure international operational tasks spending from humanitarian missions to combat missions. The latest design draft of the new patrol ships, here seen with the Dutch guidance, surveillance and early warning systems, APAR (fore) and SMART L (aft). The Danish Defense Plan 2005-2009 included the construction of three new frigate sized patrol ships for the Royal Danish Navy. These ships are to replace the more than 25 years old corvettes of the NIELS JUEL Class. On June 22, the Danish Parliament's Finance Committee areto make its final approval to build these new ships for the Royal Danish Navy. Commissioning of these new large frigate sized ships, together with the two already built command and support ships of the ABSALON Class, will highly increase the navy's ability to perform its planned new inter-national tasks. With a displacement of an estimated 6,200 tons, the new patrol ships will have double the size of the last frigates in the RDN, the frigates of the PEDER SKRAM Class (1966-1990), and more than four times the size of the corvettes, which they are intended to replace. The patrol ships are to be built at the Odense Steel Ship Yard at Lindoe, just like the command and support ships of the ABSALON Class. They will use the same hull as the ABSALON Class, and the propulsion system will be almost the same, but with 4 main engines, giving the ship a maximum speed at around 28 knots. The endurance will be 9,000 nautical miles at 15 knots, and the ship can hold the sea for around 30 days with-out additional supplies, increasing its ability during international operations. The weapons and communication systems on the patrol ships will enable them to take part in modern network based combined operations with other nations in the support of land and sea operations. The new ships wil have a state-of-the-art ability to participate in air defense, strike and artillery support missions. 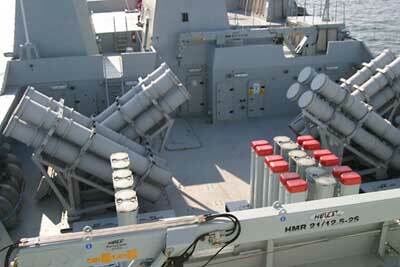 1 - Mk 41 Multi missile launcher with 32 cells for long range SAM's etc. as he continues, "the ships will be able to endure international operational tasks spending from humanitarian missions to combat missions. For the first time in present history, the RDN will have on hand, ships built for a global contribution". The main weapons platform will be placed amidship as here seen on the command and support ship ABSALON, but it will be larger, as it should also hold the Mk 41 Multi Missile Launcher. 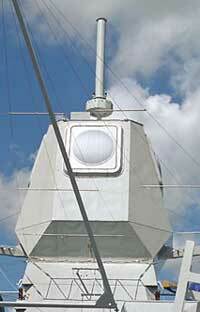 The main weapons platform will be placed amidship, as on the command and support ship of the ABSALON Class. It will hold a number of flexible container positions for the standard versions of containerized Harpoon and SeaSparrow missiles. The weapons platform will be slightly larger, as it should also hold the new Mk 41 Vertical Multi Missile Launcher planned for the new patrol ships, giving them primarily a heavily increased air defense capabilty. The launcher has been chosen, but there has been no decission on the type or types og long range missiles. Main artillery will initially be a Danish standard 76 mm Oto Melare in the A-position on the foredeck. This mount is prepared for the quick installation of the 127 mm (5"). In the B-position is a 76 mm in the Danish standard contanerized model, which makes it possible to quickly exchange the B-position with a 35 mm CIWS, depending on the task. One 35 mm Millenium CIWS will be placed in a fixed mount on the top of the helicopter hangar, as is also the case on the ABSALON Class. The patrol ships will also be equipped with MU90 anti submarine torpedoes, Stinger missiles for close-in air defense, and a number of 12,7 mm (cal. 50) heavy machine guns. The total control and communication system will be based on the C-Flex system from the Danish company Terma, a system that is introduced as the standard command and control system in the RDN. There has so far been made no final choice on the primary surveilance and guidance systems, but it appears, that the final choice will be either the Dutch APAR/SMART-L system or the British/Australian SAMPSON/ CEAMOUNT system. Both systems can deliver surveillance and early warning out to a distance of app. 400 kilomtres, and at the same time deliver guidance for a great number of air defense missiles (SM-2 and/or ESSM) at the same time. Besides from the main surveillance and guidance sensors, the ships are also planned to be euipped with a number of active and passsive electronic sensors to meet the newest requirements in modern warfare. It is also planned that the ships will be equipped with a bow mounted sonar. 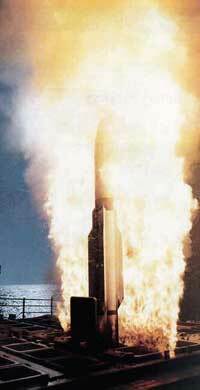 A long range SM-2 Block III missile being launched from a US Nany vessel. 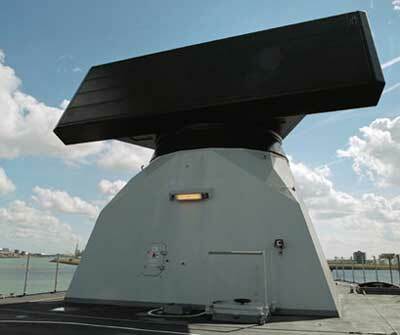 The SMART L surveillance and early-warning radar, here installed on the Royal Dutch Navy frigate DE ZEVEN PROVINCIEN, is one of the options for the new RDN frigates, notice the hatch in the middle to judge the size of the radar. The patrol ships will be the first dedicated combatants int the RDN being able to operate a helicopter from its helodeck aft. The ships will have a hangar that can house an Agusta-Bell EH-101 Merlin helicopter (Danish designation, EH-101 Joint Supporter). The Royal Danish Air Force has already taken delivery of the first eight of a total of 14 new EH-101 helicopters. The first eight are primarily to be used for SAR (Search and Rescue) and the remaining six will be equipped for tactical troops transport. The Danish Defense Plan 2005-2009 also included the acquiring of an addi-tional four helicopters in a maritime configuration for use on the command and support ships of the ABSALON Class and on the new patrol ships. No final descission has been made on the type of naval helicopters, but due to standardization, it seems most likely that the maritime version of the EH-101 will be the choice for RDN. 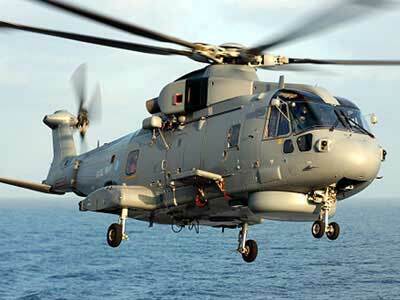 The EH-101 Merlin, here in the Royal Navy version, is also one of the options. The total cost of the three new patrol ship will be in the surrounding of 4,7 billion Danish kroners (around US$ 800 millions), which include 435 million dkr. already spend on the pre planning, and the balance amount of 4,2 billions to be accepted by the Finance Committee. The price tag does not include the future aquiring of long range air defense missiles etc. This descission wil most likely be included in the upcoming Defense Agreement after 2010. Should the RDN descide to equip the ships with a 127 mm (5") gun, due to a change in the operational pattern; such a descission would call for a new separate apporval. Bearing in mind, that the expected lifetime of the new ships are expected to be around 30 years, the total costs seems reasonable, and far beyond those amounts used by other nations on new similar naval projects. Helicopters for the patrol ships are not included, as these helicopters are a separate part of the Defense Plan, and this descission will be made during the upcoming year. Final planning of the project will take place during the coming year with an actual production start on the first ship planned at October 16, 2007.